Estriol (also oestriol or E3) is one of the three main estrogens produced by the human body. Human steroidogenesis, showing estriol at bottom right. In essence, it follows the pathway from dehydroepiandrosterone or DHEA (at left), but with a modified DHEA with an additional OH-group. Estriol is only produced in significant amounts during pregnancy as it is made by the placenta from 16-hydroxydehydroepiandrosterone sulfate (16-OH DHEAS), an androgen steroid made in the fetal liver and adrenal glands. The human placenta produces pregnenolone and progesterone from circulating cholesterol. Pregnenolone is converted in the fetal adrenal gland into dehydroepiandrosterone (DHEA), a C19 steroid, then subsequently sulfonated to dehydroepiandrosterone sulfate (DHEAS). DHEAS is converted to 16-OH DHEAS in the fetal liver. The placenta converts 16-OH DHEAS to estriol, and is the predominant site of estriol synthesis. Levels of estriol in non-pregnant women do not change much after menopause, and levels are not significantly different from levels in men. In pregnant women with multiple sclerosis, estriol reduces the disease's symptoms noticeably, according to researchers at UCLA's Geffen Medical School. 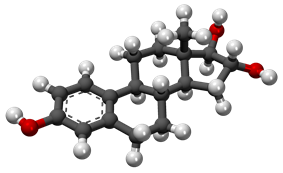 Estriol can be a weak or strong estrogen depending on if it is given acutely or chronically when given to immature animals, but is an antagonist when given in combination with estradiol. Estriol may play a role in the development of breast cancer, but based on in vitro research, does appear to act as an antagonist to the G-protein coupled estrogen receptor. Though estriol is used as part of the primarily North American phenomenon of bioidentical hormone replacement therapy, it is not approved for use by the FDA or Health Canada. Though initial research in the 1970s suggested it could be used therapeutically as an estrogen, subsequent research failed to confirm this hypothesis. Estriol can be measured in maternal blood or urine and can be used as a marker of fetal health and wellbeing. DHEA-S is produced by the adrenal cortex of the fetus. This is converted to estriol by the placenta. If levels of unconjugated estriol (uE3 or free estriol) are abnormally low in a pregnant woman, this may indicate chromosomal or congenital anomalies like Down syndrome or Edward's syndrome. It is included as part of the triple test & quadruple test for antenatal screening for fetal anomalies. Because many pathological conditions in a pregnant woman can cause deviations in estriol levels, these screenings are often seen as less definitive of fetal-placental health than a nonstress test. Conditions which can create false positives and false negatives in estriol testing for fetal distress include preeclampsia, anemia, and impaired kidney function. ^ Raju U, Bradlow HL, Levitz M (1990). "Estriol-3-sulfate in human breast cyst fluid. Concentrations, possible origin, and physiologic implications". Ann. N. Y. Acad. Sci. 586: 83–7. ^ Sicotte NL, Liva SM, Klutch R, Pfeiffer P, Bouvier S, Odesa S, Wu TC, Voskuhl RR (October 2002). "Treatment of multiple sclerosis with the pregnancy hormone estriol". Ann. Neurol. 52 (4): 421–8. ^ Melamed M, Castaño E, Notides AC, Sasson S (November 1997). "Molecular and kinetic basis for the mixed agonist/antagonist activity of estriol". Mol. Endocrinol. 11 (12): 1868–78. ^ Lappano R, Rosano C, De Marco P, De Francesco EM, Pezzi V, Maggiolini M (May 2010). "Estriol acts as a GPR30 antagonist in estrogen receptor-negative breast cancer cells". Mol. Cell. Endocrinol. 320 (1–2): 162–70. ^ Derzko, C (2009). "Bioidentical Hormone Therapy at Menopause" (pdf). Endocrinology Rounds 9 (6): 1–6. ^ Pagana TJ, Pagana KD (2009). Mosby's Manual of Diagnostic and Laboratory Tests. St. Louis: Mosby. p. 240. See instead (modulators of 20,22-desmolase, 17α-hydroxylase/17,20-lyase, 3β-HSD, 17β-HSD, 5α-reductase, aromatase, and 27-hydroxylase).